66 percent of Russians hope for God's help in their daily life to a certain extent. Russians have begun to hope for God's help, and/or have begun to speak about the predestination of people's fate by God, twice as often in the past 25 years, sociologists said, citing a poll conducted by the All-Russia Public Opinion Research Center (VTsIOM). The poll, which surveyed 1,600 people living in 130 populated areas, of 46 regions of Russia, was conducted on April 23-24. Sixty-seven percent of the respondents said they hope for God's help in their daily life to a certain extent, which is a 18 percent increase from 1991 (49 percent). Fourteen percent of the respondents (against 21 percent in 1991) said they do not believe in God, and 11 percent said they do not hope for God's help. Three percent of the respondents answered differently and 5 percent were undecided. 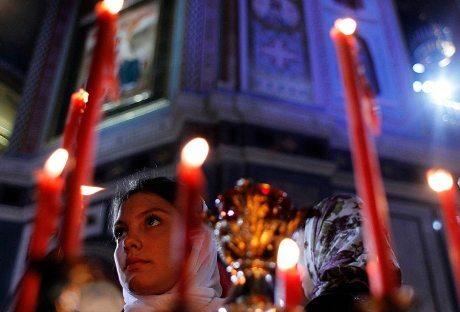 Religion in Russia: What regions believe in Christ, Allah and Buddha? As compared to 1991, Russians now believe more in phenomena associated with religion. Fifty percent of the respondents said they believe in religious miracles, which is a 18 percent increase from 1991 (32 percent). Forty-six percent of the respondents (against 33 percent 25 years ago) are confident that there is life after death. Forty percent believe in the devil and hell (against 25 percent and 24 percent in 1991). Responding to a question as to whether human life is predestined by higher forces, 48 percent of the respondents said that it is (against 25 percent in 1991). Forty-five percent of the respondents surveyed in 1991, said that human life does not depend on God's plan, and now, only 26 percent of the respondents said so. Eighteen percent of the respondents said they equally disagree, and agree, with the allegation that human life is predestined by God. Speaking about whether anti-religious works should be banned at the legislative level, 58 percent of the respondents answered positively. This indicator has not changed since 1991 (58 percent). Twenty-five percent of the respondents spoke against such a ban, and 17 percent were undecided. "Not one church is empty"
The rise of religious sentiment among citizens has been noticed, particularly by the Russian Orthodox Church. The number of parishioners is growing not just quantitatively, but qualitatively, the head of the press service of the Patriarch Alexander Volkov told RBTH. "We experienced the first wave of religiosity just after the Soviet period, when crowds of people went to the church, but it was not always a conscious effort,” said Volkov. “Now people are doing it with more forethought." The church has taken notice and over the past five years, Moscow has significantly increased the number of parishes – from 894 in 2012 to 1,110 in 2015. But this is not enough according to Volkov. "Now we understand that we need many more churches,” he said. “Not one of the constructed temples is empty. All are full or are even overcrowded."